I admit that I regularly use Internet Explorer at work because I am a creature of habit and I like knowing where everything is, not because I particularly love it above any other browser. I do use Google Chrome as well. When I am monitoring the library Live Chat facility I have that open in Chrome for 2 reasons: firstly because it gives you desktop notifications of any new chats in addition to an audible ping, and secondly because if I have it open in Internet Explorer I tend to close it down accidentally by clicking 'yes' to close all tabs when what I mean is 'close all the other tabs but not that one'. I have an irrational dislike of Firefox. I'm not sure what it is; it's got a cool, superhero name, the functionality is no worse (and possibly even better) than IE, it doesn't look strange and fearful. I think it's based on the fact that on one of the computers I use at work it doesn't seem to work properly, although on my office PC it is fine. If I had to pick a favourite browser I would probably choose Chrome so I might use that more at work and switch to Firefox to monitor Live Chat (again you can enable desktop notifications which I don't think you can do in IE). It was interesting to look at the keyboard shortcuts for the different browsers; I use 'paste as plain text' a lot so it's useful to know that I can use the shortcut ctrl + shift + V instead of right-clicking. 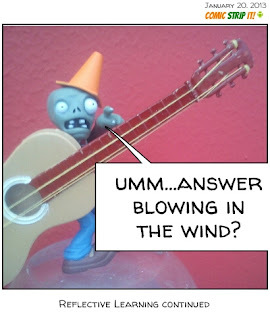 So cone-man is going for the musical links too -I like his style and choice!